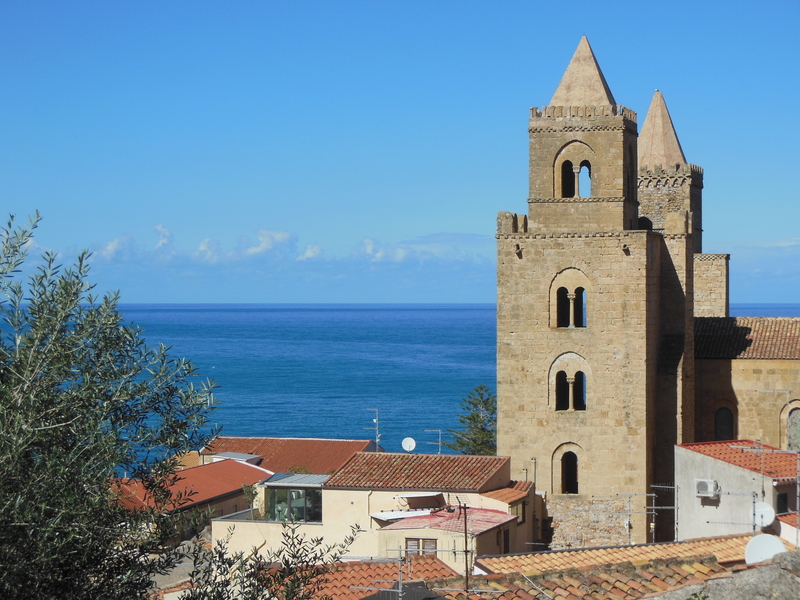 Cefalù, in Northern Sicily, is indisputably scenic. It’s dramatically set on the Mediterranean, with a giant rock mountain looming above it, full of golden light, palm trees, and twisty medieval streets. Despite it’s attractive qualities, we spent much of the day irritated with the tourist industry of the town, which has three major sights, two of which were closed for inexplicable reasons. Sicily so far is gorgeous and a bit frustrating–buses are slow and opening hours are unpredicable. The entire island seems to be packed full of old men hanging out on every street corner and bench, shooting the shiz all day. 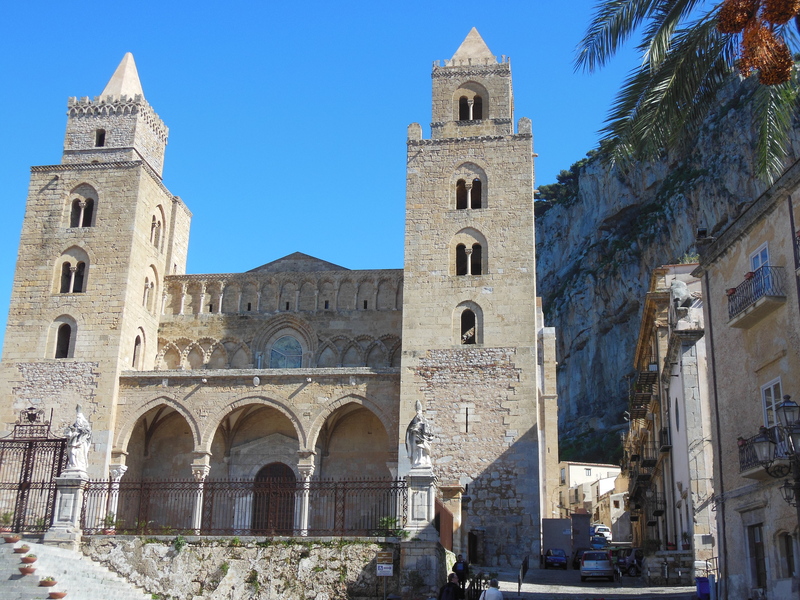 Fortunately, the Cefalù cathedral, a splendid Arab-Roman stunner, was open for visitors. 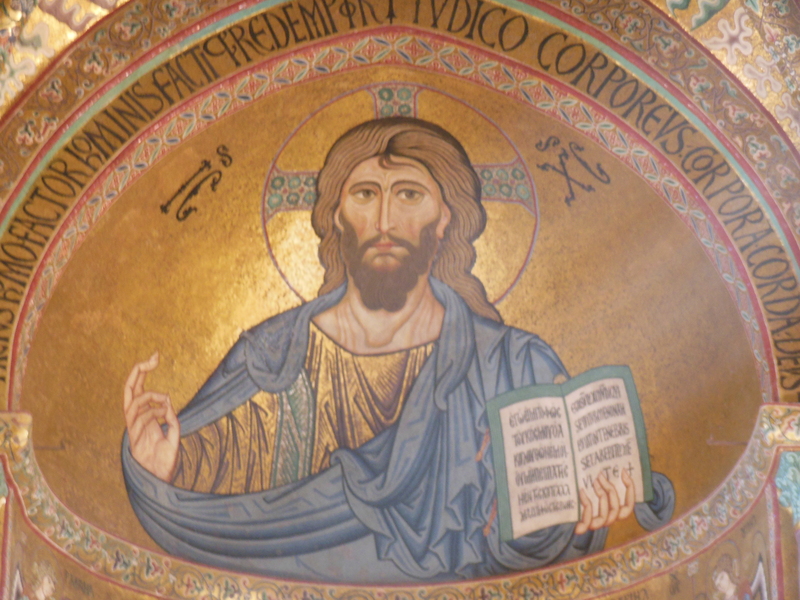 This was the third Norman Cathedral with Byzantine mosaics we’ve visited on our current trip to Sicily. I like to see a minimum of three examples of a regional architectural style, so that I understand it’s traits better. 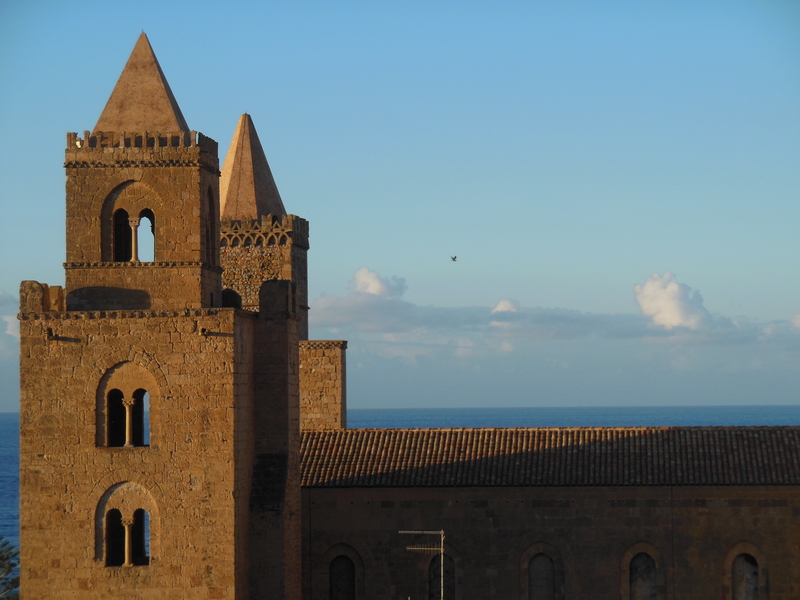 Cefalù’s Byzantine mosaics are the earliest in Sicily, from 1148, though only the apse is in the original style–the rest of the cathedral interior is ho-hum Baroque with a few fine Romanesque bits and pieces. Our day was saved by a glorious sunset, immediately after which the children of the town swarmed the streets dressed in costume for Carnevale. It was kind of like Halloween in the US, but the kids carried bags of confetti and tossed it at each other. (We didn’t take pictures of the kids because it’s sort of sketchy to take pictures of other peoples children). We slowly walked the main drag of the town back and forth, watching the charming children spring out at each other with tiny confetti explosions. How we got to Cefalù: train from Palermo. Where we slept: Hotel Mediterraneo. Price: €60 for a double. Recommended: yes. 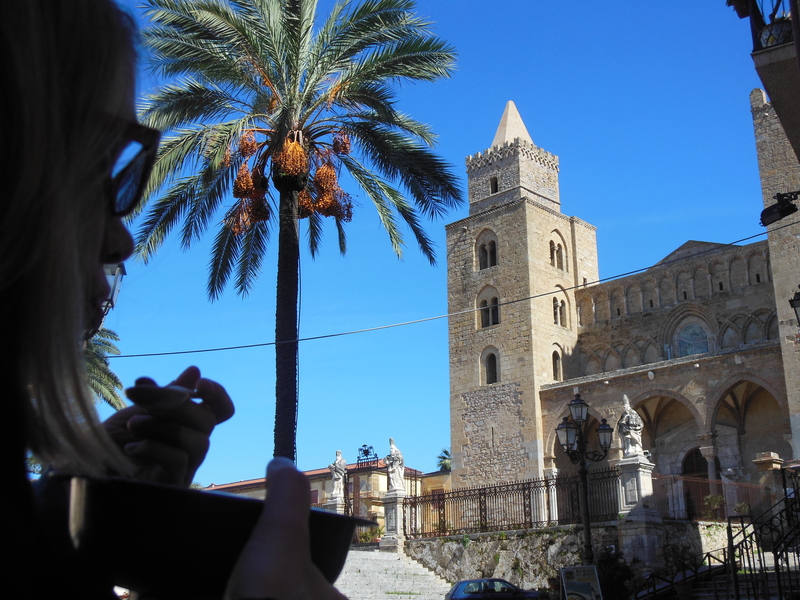 Picnic at Duomo di Cefalù. The men and the sunsets in Cefalù are both quite attractive. 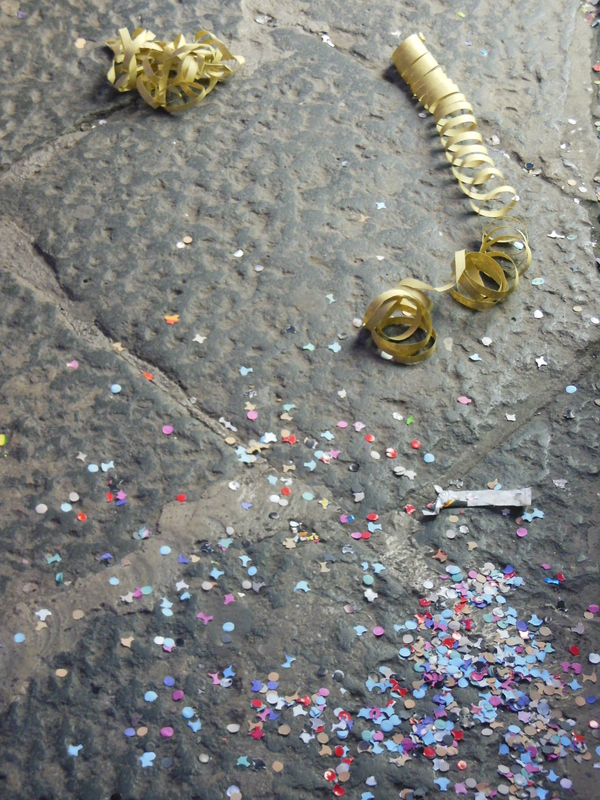 The streets are covered with confetti.